Denmark, mid-1950s This low easy chair has been designed in the style of Nanna Ditzel’s 1953 “Pot” chair. Poised on solid oak tapered legs, the circular frame enfolds the sitter in its embrace. The piece features soft gray suede upholstery. United States, 1968 This rarely seen lounge chair, designed by Edward Wormley for Dunbar, sets a green leather-embossed vinyl sling seat into an elegant frame of ash that opposes a rectilinear base with curved arms. Denmark, 1950s Designed by Hans Wegner for GETAMA in 1953, this low-back lounge chair has a solid oak frame. Germany, 1960s This no. 92 Scissor Chair was designed by Pierre Jeanneret and manufactured by Knoll International in Germany. It is composed of a birch frame with cushions that were previously reupholstered. Denmark, 1960s This classic high back lounge chair by Hans Wegner features a teak frame, wide paddle arms, and beige cushions. It is in all original condition. Sweden, 1950s Designed by Folke Ohlsson for the Swedish manufacturer Dux, this lounge chair offers a supremely comfortable seat within an exposed teak frame. The chair was previously reupholstered. Denmark, 1957 The papa bear chair, a modern interpretation of the classic easy chair, was designed in 1950 by Hans Wegner and manufactured by A.P. Stolen. This chair was purchased in 1957. The ottoman measures 27.5″W 16″D x 15.5″H. Sweden, 1950s This chair was designed by Folke Ohlsson and manufactured by Dux. It features a teak frame and a very comfortable seat, which has been newly reupholstered in Knoll’s Cuddlecloth in Torch. Two available, price per piece. Denmark, 1950s This vibrant lounge chair, designed by Hans Wegner, features a boxy seat on cylindrical stainless steel legs. It is newly upholstered in Maharam’s Hallingdal by Kvadrat: 590. Denmark, 2007 Poul Kjaerholm designed the award-winning PK22 lounge chair in 1956. 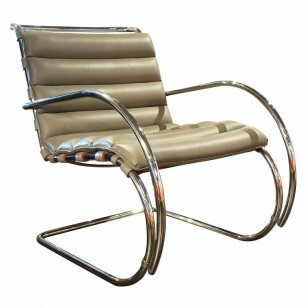 This later production of his cleanly profiled chair features classic black leather on a matt chrome steel frame. USA, 2006 Designed by Harry Bertoia in 1952, this iconic chaise longue was produced by Knoll in 2006. It is composed of a chrome wire frame with a black Classic bouclé cover. USA, 1950s This armchair, model 1209C, was designed by Adrian Pearsall and manufactured by Craft Associates. It features a sculptural walnut frame in original condition with cushions that have been reupholstered in Knoll textile (Venue: Tabby). Italy, 20th century Designed by Le Corbusier in 1928, this modern club chair is composed of a chrome frame and four black leather cushions. Manufactured by Cassina. Finland, 20th century Designed by Alvar Aalto in 1939, this armchair is known as the Pension chair. It is composed of a cantilevered birch plywood frame and a linen webbed seat. 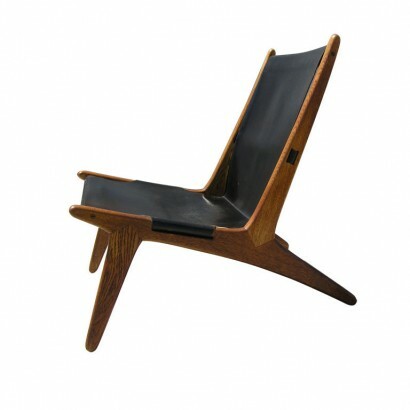 USA, 1998 The iconic Eames lounge chair and ottoman, this chair features walnut veneer and black leather. Ottoman measures 26″ W x 22″ D x 16″ H.
Hong Kong, 1960s This pair of chairs were designed in Finland by famed designer Eero Aarnio. These chairs feature a unique round design and are composed of woven wicker. USA, 1970s This Classic womb chair was reupholstered once in Knoll cuddle cloth textile. The foam and fabric are in excellent condition. Italy, 1970s Giovanni Offredi designed these comfortable lounge chairs as part of his Onda Series for Saporiti. The seat floats wavelike above sturdy chrome legs. These chairs have been expertly reupholstered in black leather and Knoll’s Cuddle textile. Germany, 1960s This no. 92 Scissor Chair was designed by Pierre Jeanneret and manufactured by Knoll International in Germany. It is composed of an expertly refinished birch frame with cushions that have been newly reupholstered in Knoll textile. Denmark, 2000 The PK22 chair was designed by Poul Kjaerholm in 1956. This pair features classic black leather on stainless steel frames. Denmark, 1950s This exceptional chair features an exaggerated wingback silhouette and elegant curved arms. It is upholstered in rich gold velvet that is in excellent condition. Denmark, 1960s This pair of armchairs was designed by Grete Jalk and manufactured by Cado. They features exposed teak frames with wide, comfortable seats and the original striped upholstery. Denmark, 1960s This armchair by Hans Wegner for Getama, known as the cigar chair, features a solid oak frame with original spring cushions and upholstery. Corresponding sofa also available. Denmark, 20th Century Designed in 1950, these lovely easy, CH-25 chairs are simply but beautifully constructed of oak and paper cord. Denmark, 1960s These armchairs, designed by Ib Kofod-Larsen, feature open walnut frames and newly upholstered off-white striped seats. Each chair has two casters to facilitate mobility. Sweden, 1960s This teak-framed armchair and ottoman is attributed to Dux of Sweden. Recently reupholstered in a soft, taupe textile, it features a very comfortable seat with headrest. The ottoman measures 23″ W x 17.5″ D x 15″ H.
Denmark, 1950s The classic CH-28 armchair was designed by Hans Wegner in 1951 and was one of the first five designs he created for Carl Hansen & Son. This Sawback armchair is upholstered in original textile and is extremely comfortable. USA, 1960s This LCM is a rare Zebra production for Herman Miller. Denmark, 1950s This chair was designed by Hans Wegner in 1951 and manufactured by AP Stolen. It is composed of an oak frame with dark grey leather upholstery. The leather is well-aged with a beautiful texture and patina. Denmark, 1960s The iconic Papa Bear chair by Hans Wegner. Upholstery services available upon request. Denmark, 1950s Designed in 1950 by Hans Wegner, this lovely armchair is simply but beautifully constructed of oak and paper cord. Denmark, 1950s This lounge chair, designed by Hans Wegner, is upholstered in buttery, burgundy leather and features a boxy seat on cylindrical stainless steel legs. Denmark, 1960s Unique angular Danish armchair with ebonized wood accents. USA, 1950s These armless lounge chairs by Paul McCobb feature ebonized wood frames and are upholstered in a unique pink chinoiserie satin. 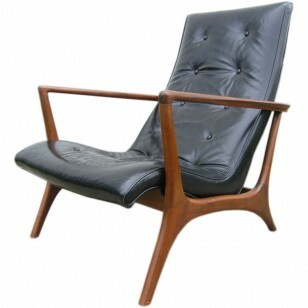 United States, 1950s This walnut armchair is classic Jens Risom: stylish, comfortable, and high quality. Low and wide, with angled armrests, the proportions are well considered. The seat and snap-on back rest are upholstered in a knubby Knoll textile. Denmark, 1960s Finn Juhl designed this lounge chair, known as the Bwana Chair, in 1962. Its teak frame cradles a comfortable seat upholstered in rich olive leather. This chair is a very early production, with stamps on the frame. Denmark, 1960s The Corona Chair was first produced by Danish designer Poul Volther in 1958, and received instant acclaim. Originally made from solid oak, experimentation with various materials led Volther to re-release it in steel in 1960. Sweden, 1950s Curvilinear lounge chair and ottoman by Bruno Mathsson, composed of hemp webbing on a molded beech plywood frame with an adjustable headrest. Signed with stamp on frame. Ottoman measures 20.25″ W x 26″ D x 16″ H.
Italy, 1976 Mario Bellini “Amanta” chair, by B&B Italia, 1976, signed with impressed marks. USA, 1950s Elegant and classic early design by Edward Wormley. 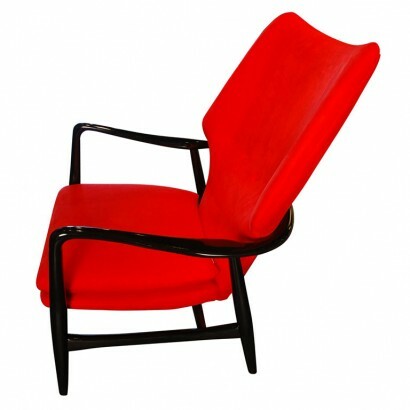 USA, 1950s These armchairs feature a distinctly 1950s silhouette with tapered black metal legs. They have been reupholstered in a soft blue microfiber with contrasting black piping. Denmark, 1957 This unique high-back armchair features original two-tone upholstery in black and oat on a partially exposed solid oak frame. Denmark, 1950′s Very comfortable oak frame high back lounge chair by Hans Wegner for Getama. USA, 1950′s Deep and comfortable armchair with brass leg by Edward Wormley for Dunbar. Newly reupholstered in Knoll textile “Classic Boucle” in Pearl. Denmark, 1950′s Very comfortable oak frame high back lounge chair by Hans Wegner for Getama. Newly reupholstered in Knoll textile Cuddlecloth in Black Sheep. Ottoman measures 22.5″ W x 19″ D x 15″ H.
Denmark, 1960′s Jorgen Hovelskov designed the iconic Harp Chair in 1968. It is reminiscent of the bow of a Viking ship, and its flag halyard seat provides a unique optical effect. USA, 1950′s This elegant pair of side chairs buy Jens Risom are very comfortable. Beautifully reupholstered in luxurious Knoll Rivington textile. Denmark, 1950′s This classic high back lounge chair by Hans Wegner features wide paddle arms and is all original condition with vibrant green textile. 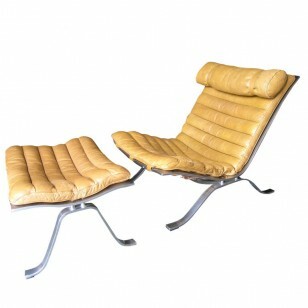 Denmark, 1950′s This armchair is in amazing original vintage condition. No wear or damage to the textile, it looks like new. Denmark, 1960′s This chair has a great presence and a striking look from all angles. Solid and comfortable, this chair is trimmed in white piping which accentuates its unique design. Denmark, 1960′s The wonderful Knoll textile on this chair accentuates its bold lines. Extremely comfortable. USA, 1950′s This pair of black and white molded plywood armchairs are an iconic design by George Mulhauser. USA, 1950′s Maple lounge chair designed by Leslie Diamond for Conant Ball. Manufacturer’s stamp on bottom. Denmark, 1960s Made in Denmark in the style of Hans Wegner or Arne Jacobsen, this high-back armchair features a comfortable seat reupholstered in Knoll’s Haze textile (color Peat) and resting on chrome tubular legs. Denmark, 1960′s This Papa Bear chair is upholstered with original wool textile. Denmark, 1950′s This graceful armchair by Illum Wikkelso is in remarkable condition with all original textile and soft foam. United States, 1970s Inspired by Marcel Breuer’s tubular steel designs, the MR Chair is a beautiful example of van der Rohe’s work. In all original condition. Sweden, 1950′s This chair has been beautifully crafted. The leather straps under the seat have been replaced, but the one behind the back is original. The leather has a nice patina. Denmark, 1950s This striking chair is beautifully upholstered in red faux-suede and is very comfortable. USA, 1980′s Designed in Italy in 1929, this MR chair was manufactured by Knoll circa 1980. 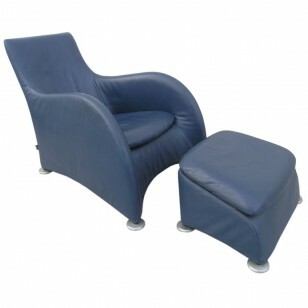 USA, 1950′s This stunning armchair in the style of Vladimir Kagan is in wonderful, completely original condition. The black leather has a beautiful patina and the graceful curving frame makes this chair a piece of art. Manufacturer label March 1959. This armchair and ottoman by Arne Norell is in original vintage condition and the leather has developed a wonderful patina over time. Ottoman measures 25″W x 20″D x 15″H. 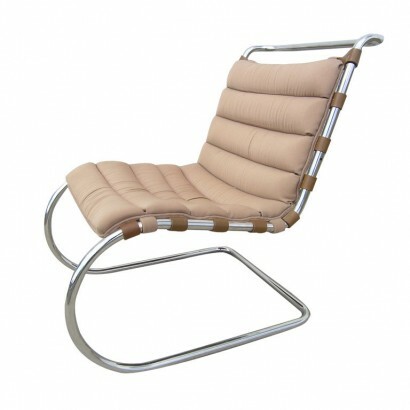 Italy, 1970′s This striking chair is solidly constructed with a heavy sturdy metal frame woven in wool. 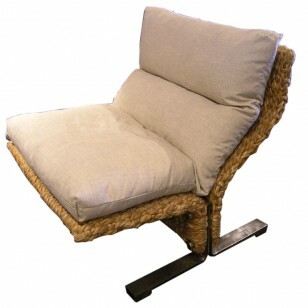 With a newly reupholstered down-fill removable cushion, this lounge chair is extremely comfortable.